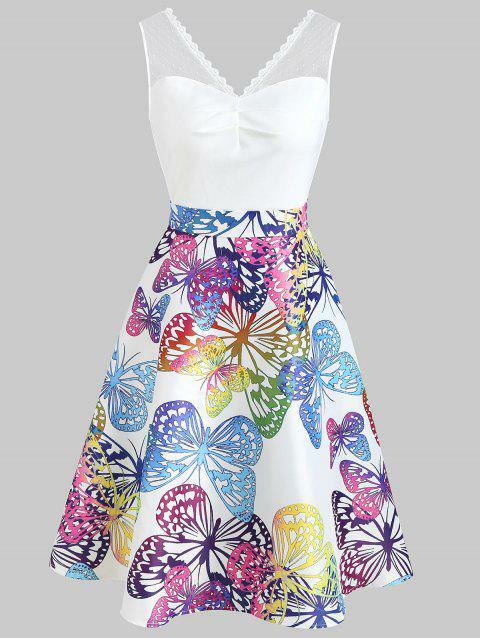 The casual elegant dress features see-through white lace panel shoulder with wave cut, multicolor butterfly patterned skirt with the high waistline and flared silhouette, and cool V-shaped cutting at the back. It's suited for semi-formal occasions, summer party, travel vacation or office wearing. Back zipper closure. I received this dress on time! I ordered this for my Maid of Honor's dress for the ceremony & it's perfect! It fits her perfectly also! I can't wait to see her wear it during the ceremony!!! I love this dress! I ordered it for my Bridal shower and it's perfect for my theme. So cute and fun, yet also appropriately dressy. I followed the size guide and ordered accordingly! The dress is perfectly made and fits like it was tailored just for me! I love it! The cut is great for women with large thighs and hips! Highly Recommend. Q:Can you let me know what size 8-10 would be? Q:Hi what would be your equilvilant to size 12? It is size L on our site. Q:Please can you tell me what UK size your 2xl is equivalent to? Size 2XL on our website is UK 16. Q:What is the length of the dress please? Also which size is suitable for 16/18 please? Q:How cm is waist in size S and size M? is the material elastic?